Pastor Valerius Herberger (1562–1627) served St. Mary's parish church in Fraustadt (now Wschowa) Poland during the most difficult days of the Counter-Reformation when a royal decree ousted the congregation from its building in 1604. 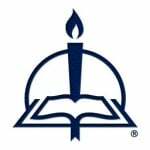 As a deacon and preacher in the congregation for nearly forty years, Herberger left us a remarkable example of biblical interpretation, application, and sincere devotion. 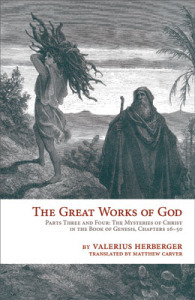 His meditations on Genesis have been translated by Matthew Carver in The Great Works of God. The following excerpt is taken from The Great Works of God, Parts Three and Four: The Mysteries of Christ in the Book of Genesis, Chapters 16–50 and is offered in celebration of Pastor Herberger’s birthday tomorrow. XLI. Jesus Is Still Alive, and Is a Lord Rich toward All Christians; with Him All the Elect Find Living Consolation and Have Enough for Eternal Life (Gen. 45:26). Jacob found out that Joseph was alive only after twenty-two years. Behold what a long time Jacob had to weep and lament. Oh Lord Jesus, give Jacob’s patience and faithfulness to all Christians who have to grieve and endure misery for a long time. Jacob thought for twenty-two years that he was crying because of a great adversity. Now the outcome showed that he had unwittingly wept for his own prosperity. Thus is God able to honor those who stay true to Him in cross and misery, so that all their sorrow is turned into joy beyond imagining (John 16:20). Jacob could scarcely believe his sons’ words; for when the message is too good it is hard to grasp it. He could not immediately accept the news as true because of his great joy. Behold, how sincerely joyful parents’ hearts are when their children prosper! Oh dear children, strive for honor and virtue. In time it will prove nothing but marzipan and cordial. This, then, was the happiest hour that Jacob had in all his days in this world. Therefore Moses says, “Then the spirit of Jacob . . . revived.” And Jacob himself said, “ ‘It is enough that my son Joseph is still alive.’ Now I am old and wealthy enough.” Behold, God is faithful, and He will not put on us more than we can bear (1 Cor. 10:13). Jacob was not forced to weep for a thousand years. “God will not leave the righteous man in disquietness forever” [Ps. 55:22]. And whoever trusts in God will find this out. Here we find another beautiful portrait of Jesus Christ. Joseph was still alive. O Lord Jesus, You are still alive. You died for my sins once, but now You live and reign for all eternity and die no more. With Job 19:25 I can say, “I know that my Redeemer lives.” “He lives, He lives, He lives,” said Luther in his motto when he was advanced in years. “If He were not alive, I would not wish to live a single hour.” If all the world dies and leaves me, O Lord Jesus, You are still alive. By Your grace I too will be alive, even though I die. “Yea, I shall not die, but live, and make known the works of the Lord” (Ps. 118:17). Joseph was lord of all Egypt. O Lord Jesus, You are Lord of all Christians, the Lord and “Savior of all men” [1 Tim. 4:10], rich toward all who call on You [Rom. 10:12]. Jacob’s spirit revived when he heard this comforting news about Joseph. O Lord Jesus, when I am in deathlike anguish and I hear this and am reminded that You are still alive and still my Lord, my spirit revives. I become as glad as one arisen from the dead. I am eager for prayer and every Christian virtue. My heart is defiant in this consolation: my Jesus, my heavenly Joseph, is still alive, so He will hear my sighing. Jesus is still alive, so He will lighten my cross. The evil foe presses me on every side, but Jesus is still alive and will protect me. The unbelieving world vexes me, but Jesus is still alive and will help me overcome. Jesus is still alive and will pluck me from the grave and bring me to eternal joy. Jacob said that it was enough that Joseph was alive. Indeed, O Lord Jesus, it is enough for our salvation that You are alive and have let Your precious blood avail for us. Nothing is enough for anyone’s salvation without You. “If I have but you, I ask for nothing in heaven and earth” (Ps. 73:25). If I have known You, it is wisdom enough. If I recall Your merit, it is comfort enough in the distresses of body, soul, and death. If I die believing in You, it is exactly enough for eternal life. Yea, thus I enter heaven, where it shall all be “God and enough.” “I will be satisfied when I awake after Your likeness” (Ps. 17:15). Behold, in the blink of an eye this unexpected joy so totally stripped away twenty-two years full of sadness that not one shred of it was remembered again. Likewise, the first glimpse of eternal blessedness will fill our hearts with such exultant joy that all previous hardship will be forgotten. With the first glimpse and step into eternal glory, all our past misery will be wholly and completely swallowed up. Oh Lord Jesus, come soon, wipe the tears from our eyes, and turn our heartache into everlasting joy and blessedness. Amen. From The Great Works of God, Parts Three and Four: The Mysteries of Christ in the Book of Genesis, Chapters 16–50, pages 440–42. English translation © 2011 Matthew Carver, published by Concordia Publishing House. All rights reserved. To order The Great Works of God, Parts Three and Four, please contact CPH at 800-325-3040 or visit www.cph.org. Concordia Publishing House has also published The Great Works of God, Parts One and Two.